This post is kindly brought to you by The Green Goddess Beauty Shop, who compensated me for this sponsored post. All product descriptions, tips and opinions are my own! Regardless of whether you’ve been using natural beauty products for years or are just now transitioning, the green beauty scene can be a bit overwhelming. With brands and products are launching left and right, it can be a big upfront investment to try something new. Thankfully, there’s a wide variety of green beauty subscription boxes that offer interesting, effective products to test before committing to a full size. The latest box on my radar is from The Green Goddess Shop, a natural beauty boutique based in South Bend, Indiana. Newly launched in summer 2016 by Aubrey Sousley, The Green Goddess Beauty Shop is an online green beauty retailer that also offers a $20 subscription box filled with 4-5 different natural beauty samples to experience every month. The box caught my attention because of its healthy mix of established clean beauty brands and indie, up-and-coming lines. 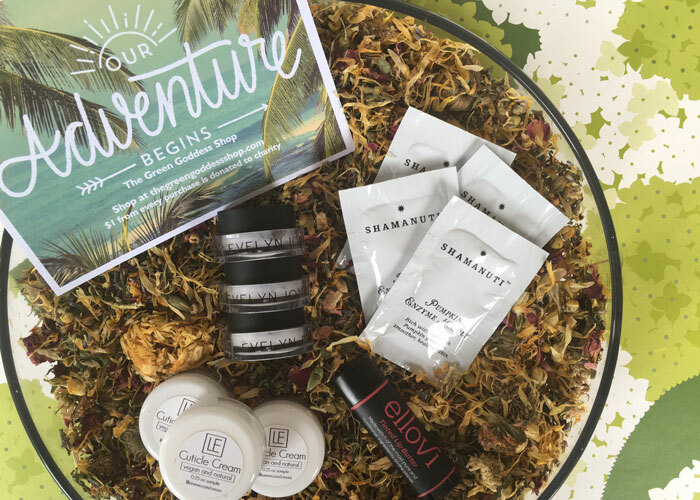 For example, my August box features samples from Shamanuti, Evelyn Iona, Lillian Eve and Ellovi. I’ve only experienced one of these brands, so I was thrilled to get a taste of the other three. And isn’t new product discovery the whole point of trying subscription boxes? When you’re able to get generous samples from truly new-to-you brands and products, you get that twinge of excitement that has you ready to explore a brand you otherwise might have never discovered. The Green Goddess Beauty Shop’s monthly box hits the mark there, but it also gives back in two other important ways. First, $1 from every purchase is donated to The Global Fund for Women, a nonprofit organization that supports women’s human rights initiatives. Second, The Green Goddess Beauty Shop offers 20 percent off featured products in its online shop. That’s a pretty generous discount — especially when you’ve found a new favorite! Aubrey sources new lines for the shop based both on her personal taste and the brand’s overall mission. 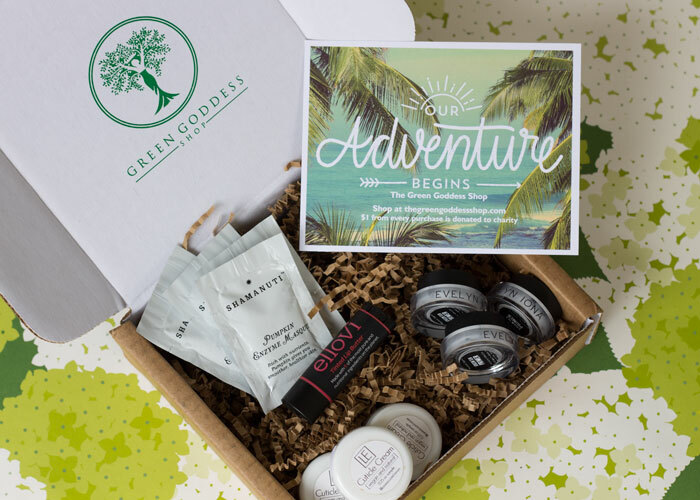 Here’s to a new beginning — a lovely new obsession with The Green Goddess Beauty Box! What are your favorite subscription boxes? How do you choose which box is right for you? Tell me in the comments!